International investing can be daunting if you don’t know where to begin. Forget the problems of choosing good stocks from the other side of the world – just knowing how to buy them can be tricky enough. If you’re reading this article, you probably already have a stock broking account. But unless your broker is one of a select few specialists, it probably isn’t a great help in buying foreign shares. Typically, brokers either offer a very limited range of foreign markets or charge prohibitively high fees for foreign dealing. That’s not a big surprise. In the past, the vast majority of regular investors never bought shares outside their home country, so there was little need for brokers to offer these services. But the situation is changing. Many more people are buying foreign stocks and it’s becoming ever easier and cheaper to do. We’ll run through each of these in detail. But the links above let you jump ahead to the section you want. The simplest way to buy foreign shares sounds like a bit of a cheat – but it can be done through almost any stock broker. If you live in a country such as the UK and the US, you may find that there are already a substantial number of foreign stocks listed on your local stock market. These foreign stocks fall into two main groups. The first consists of companies that carry on most of their business abroad but have their main listing on your exchange. This is usually either because their head office is in your country or because they decided to list abroad to be on a bigger, more liquid stock market. The second consists of shares that are listed on a foreign exchange but have depositary receipts (DRs) listed on your exchange. A depositary receipt is essentially a certificate representing rights over a share listed abroad in a different market and it can be bought and sold just like a normal share. The underlying shares that the depositary receipt represents are held on trust for the bank that issues the depositary receipt. Depositary receipts listed in the US are called American depositary receipts (ADRs), while those listed in London, Luxembourg or other markets are known as global depositary receipts (GDRs). Those issued in Europe are also sometimes known as European depositary receipts (EDRs). See here for full details of how depositary receipts work. 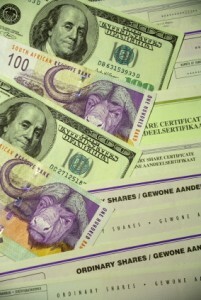 The advantage of buying foreign shares listed on your local stock exchange is that it’s simple. They trade in your own time zone, usually in your own currency – although GDRs are sometimes priced in US dollars, regardless of where they are listed – and can be bought through practically any local stock broker. If you already have a share dealing account, you can almost certainly buy foreign shares this way without having to make any changes. There are a few stock brokers that won’t deal in ADRs and GDRs, but it’s increasingly unusual. The main disadvantage is that only a limited number of international stocks are available through local listings, meaning that you will be unable to invest directly in many companies, sectors and countries. In addition, while some large and high quality companies are listed like this, many smaller firms are of poor quality. A firm may choose to list abroad in a market where few people know its business and it will be a novelty, rather than listing in its home market where it will be scrutinised more carefully. Overall, local listings of international stocks can be very useful and some good companies are available. However, having this as your only way to buy foreign shares will not be enough for the serious international investor. So if this is all your stock broker can offer you, it may be time to get a better broker. Can your stock broker buy foreign shares? Modern trading technology means that many stock brokers can now buy international shares for around the same commission that you pay to buy local stocks. If your stock broker does not do this and there is no other compelling reason to stick with them, you should strongly consider opening a new account with someone else. There are two different ways in which brokers will buy international shares on your behalf. In some cases, the firm will have local offices or partners in the country in which you want to buy the foreign shares. When you place an order for a share, it’s bought on the foreign exchange by the local office or partner. The main advantage of this approach is that it’s usually cheaper. The disadvantage is that the stock broker needs to have local accounts in place in each market. So if you want to buy a foreign stock listed in a market that it doesn’t already offer, that won’t usually be possible. If you have a large account, some specialist high-end firms may be flexible and look at opening a new account for you in that market. But the average online discount broker will not do this. The alternative way to buy international shares is that the stock broker doesn’t have a foreign office or partner, but instead tries to buy the foreign shares from market makers in your home country. A market maker is an intermediary that trades with stock brokers, buying and selling stocks, aiming to make a profit from the spread between the bid price and the offer price. The advantage of this is that the firm doesn’t have to be tied to specific markets. If you want a stock listed in Taiwan but clients don’t usually ask for this, it can call round the market makers and try to find one that has that stock. The disadvantage is that this approach will have higher fees and you will probably get a less competitive price for the stock than buying directly. In addition, it may not be able to get all the stocks from a given market – it depends what the market maker will offer. So if you can find a broker that buys foreign shares directly for the countries you want, it’s usually best to use that firm. But a broker that uses market makers can sometimes be more flexible. You can find guides to brokers that can buy international shares in the UK, the US, Hong Kong and Singapore elsewhere on this site – follow those links for a detailed look at which firms in those country can offer deal in international markets. Using any stock broker that buys foreign shares will let you invest in many more companies than if you stick to those listed in your home country. But if you want to invest in a wide range of countries, you may still come across a problem. At the moment, even the best stock brokers only offer a limited range of international markets at reasonable cost. For example, even a good online stock broker in the UK or the US will probably buy shares in several European markets, the US, Canada and two or three in Asia. If you want to buy shares in other markets, you will probably have to pay unattractively high fees. And for many markets, you may not be able to find any broker who will deal in them. Unfortunately, there is no true global online stock broker. So most international investors stop at this point and settle for buying the foreign shares they can through a good local firm. But there is another option. It requires a bit more work, but is still less hassle than most investors tend to think – and can give you access to a whole extra world of opportunities. Opening an account with a stock broker abroad may sound like the kind of thing only the rich would do in Luxembourg or Switzerland. But in fact it’s more common and cheaper than you might think. While not all foreign countries make it easy for foreigners to open accounts, stock brokers in many major financial centres welcome foreign clients. There is one major exception to this – many firms are not willing to deal with American clients. So US citizens and residents may have to look a bit harder to find a firm that will take them. And when you do, you will usually be prohibited from investing in US stocks through that account, if the firm normally offers them to clients. But it’s no problem for a European to open a stock broking account in Singapore or Hong Kong, for example. If you’re worried about possible language barriers, a surprising number of firms everywhere will provide services in English, because English is the global language for finance and business. Ideally, you are looking for a multimarket account – one that lets you buy international shares in a number of different countries from a single account. You don’t really want to open an account in every country where you’d like to invest – it’s much simpler to have several in one place. Even if you don’t think you’ll want all the countries a good stock broker offers, you may find it useful later on. Opening the account may take a bit of work – you may need to send document certified by a lawyer or notary if you want to do it by post. Waiting until you are visiting the city and arranging to visit their offices in person can often make this simpler. Occasionally, you may also need to open an account with the local securities registry – the organisation that keeps track of who owns which shares. This is the case with any brokerage account opened in Singapore – you also need an account with the Central Depositary (CDP). And to buy Malaysian shares, you will often need to open one even if your account is with a broker outside Malaysia. However, the broker should take care of this for you and include all the necessary paperwork in its application pack. In addition, funding your account probably won’t be quite so simple as using a stock broker in your home country. You’re probably used to being able to deposit funds in your account using a debit card or something equally quick and simple. To send money from your bank to a stock broker abroad, you will need to make an international money transfer. If your bank is reasonably competent, you should be able to do this through them without too much trouble. But it may be cheaper to use a foreign currency transfer specialist. You will not normally need to open a local bank account – you can usually transfer the funds directly to your broking account. There are a few exceptions, but they are mostly smaller markets with restrictions on foreign exchange and investment. Indeed, in many countries it’s far easier for a non-resident to open a broking account than it is to open a bank account. However, in countries where opening an offshore bank account is straightforward – such as Singapore – having a local bank account may give you extra flexibility. If you do this, ask your stock broker for suggestions on which bank to use, since they may have relationship with some banks that enables faster or cheaper transfers. Once you’ve done this, you will be able to buy foreign shares in a wide range of regional markets at lower cost than you can through a stock broker in your home country. A UK or US investor opening an account with the best stock brokers in Singapore or Hong Kong will be able to invest in almost all Asian markets online – something that simply isn’t possible through UK or US stock brokers. Singapore is particularly popular with foreign investors. See the guides to opening a non-resident Singapore bank account and opening a non-resident Singapore brokerage account for more information. How safe is your money with a foreign stock broker? The main thing you should be aware of before opening a foreign brokerage account this is that your account abroad will be governed by investor protection rules in that country and not by your home country rules. So a UK investor will be familiar with the Financial Services Authority’s rules – but an account he or she opens in Singapore will be governed by Singaporean rules. This means different levels of protection from the local investor compensation scheme in the event that a broker goes bust, there’s enormous fraud and your account with them turns out to be empty. Please see here for details of some of the investor compensation schemes in major financial centres. But the compensation scheme isn’t something you want to fall back on anyway. Prevention is better than cure. You should make sure you understand exactly who you’re dealing with when you open an international stock broking account. It’s prudent to deal with major reputable firms in major financial centres, rather than obscure smaller outfits. As we’ve seen, there is no one solution that allows you to buy all foreign shares – or even invest in most of the major stock markets around the world. The more markets you want to access, the more you will need to put together different stock brokers to give you better coverage. Broadly, you should have no trouble investing in North America, Western Europe and almost all of Asia if you’re prepared to do a bit of work. A combination of three good multimarket accounts would let you cover 30-35 countries spanning the vast majority of these regions. See the article on the best international online stock brokers to find out which brokers would be most useful for this. Outside of these three regions, the multimarket stock broker model hasn’t taken hold yet. There seem to be no multimarket accounts covering Eastern Europe, South America or Africa. If you want to buy international shares from most of these countries, you will generally need a local account. It may be slightly disappointing to discover that you can’t yet buy Chilean retailers, Kazakhstan banks and Ghanaian telecoms from the same online account. And clearly, investing globally takes a bit of work if you want to be able to invest in 40 different countries. But getting started in just a few markets is much easier and that’s the best way to begin. So check the international stock brokers guide to find which stock brokers deal in which markets or read the top five online stock brokers to narrow the list down to a handful that are most useful for buying international shares.